So before I begin, let me talk a little about my schedule. Right now I'm at a bit of weird place: I've got upcoming releases that of course I'm going to cover, but a few records in my backlog have pretty extensive discographies to revisit and review. So while I'm intending to Aesop Rock, I just need some time to completely absorb his existing material. As such, I did the next best thing, went to Pitchfork, and scrounged around for an act that looked interesting... and here we are. So, introductions in case you haven't heard about this guy - and I reckon that's probably a strong possibility, given that outside of the critical circle he hasn't made a huge splash just yet. Kyle Craft is a Louisiana songwriter who started off crafting some rough-edged southern glam rock before moving to Portland and signing with Sub Pop. Now immediately for me that's a good sign - Sub Pop tends to have a good reputation with signees and I was kind of intrigued by what I heard from Craft, blending a certain sort of Southern carnival theatricality with rough-edged, early-Bowie-esque melodic grooves. And while I wasn't convinced his debut would be a great record - that sort of style can get a little gimmicky if not played with smart songwriting or poise, and it can feel a little dated - at the very least it would make for a release with a lot of personality. So I dug into his debut record Dolls Of Highland - what did we get? Well, remember when I said a few days ago that I probably was the wrong person to be covering Drake's newest record thanks to the over-exposure? Well, I suspect I might not be the best person to cover this record... and yet for a very different reason, because this album bypassed my critical sensibilities and went straight to the soul of my love for 70s rock of so many stripes. I initially referenced Bowie in discussing this record, but Craft's blend is much more peculiar and defiantly his own, picking up chunks of ramshackle southern roots rock and marrying it to the larger-than-life portraits you'd find on a Jim Steinman song - and considering his vocals remind me more than a bit of Bat Out Of Hell Meat Loaf, that's far from a bad thing. And really, that's the best place to start, with Kyle Craft himself. Rarely has there been a frontman that's impressed me this much out of the gate. And sure, part of it is a major credit to the vocal production that gives him just enough space to appear larger than life - especially on a few moments of multi-tracking which are more than welcome - but not the point where it feels the needs to smother him in reverb. 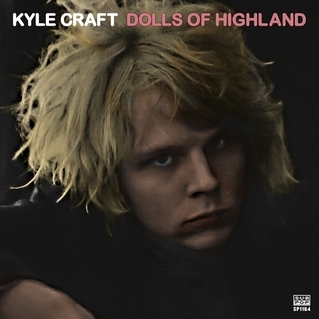 But part of it is the fact that Kyle Craft is one hell of a presence on the microphone: not always the most refined but he doesn't need to be: with a rawness to his huge range, there's a certain ragged theatricality that feel grounded in the same huge wild danger that informed Meat Loaf's best work in the 70s, the sort of larger-than-life presence that runs straight up to high camp and yet prove to be shockingly earnest and powerful regardless, particularly on the few ballads like the heavily layered Beatles pastiche on 'Trinidad Beach (Before I Ride)'. Is it garish and a little ridiculous? Oh god yes, but Kyle Craft commits to it with such force and is so damn convincing that I'm inclined to buy all of it - this is no cartoonish caricature. Granted, a major factor of that is the instrumentation, a peculiar sort of glam rock blend that Kyle Craft makes his own. And it's a little tricky to properly describe, especially in comparison with an act like Meat Loaf who always had the excuse of huge theatrical walls of sound to drive his tracks. Craft's scale is necessarily smaller but significantly more textured and unique: jaunty pianos, seedy organs, choppy acoustic strumming to match the prominent fuzzed out guitar work and warm cushion of bass, and all of it with the slightly washed out texture that reflects a live theater setting, but the sort of dilapidated theater on the edge of town, inhabited by the leftovers of the punk, goth, and alternative scene that'd never fit in a religious Louisiana town - production, I should add, that Craft all handled himself. And that seediness definitely creeps into the compositions: most are grounded in fragments of traditional country or rock & roll, but just like when Steinman did it in the 70s, Craft subverts those conventional song structures into something that is rougher around the edges, but just as catchy. And I really dig how Craft updates the gothic sensibility of the sound, most notably by injecting the 'southern' side of it: plenty of harmonica and accordion, thicker acoustic elements to reflect some of the country melodies, and instead of tilting into over-the-top horror kitsch and tropes of the time, Craft draws on tendencies that are more Nick Cave or Iceage than Meat Loaf by digging deep into religious iconography and working to humanize the distinct characters in his music. But really, that's just the method - none of this would have worked if the songs didn't deliver and by the Nine Hells, they really do. That great guitar melody driving 'Berlin', the sharper strumming that breaks into the accordion solo on 'Lady Of The Ark', that phenomenal hook on 'Balmorhea', the blast of trumpet of 'Gloom Girl' that fits better than I would have ever expected, that incredibly bright piano line that leads into some hints of Spanish guitar and fuzzed out background on 'Black Mary', and especially that echoing high notes on the solo of 'Pentecost'. If I were to criticize the instrumentation... well, I can imagine some might say the drums are a little muddy, but I honestly find them well-blended enough for it not to matter, but there are more than a few tracks that feel a little abortive or short, most notably the title track and the psychedelic 'Trinidad Beach (Before I Ride)' - I would have no problem with either song getting a little more meat on it. And the reason for that is the lyrics and themes. This is where Kyle Craft really surprised me, because on the surface this is a 'break-up album', and considering its heritage in 70s rock and a focus specifically on women across this album, I was expecting plenty of tracks with unsettling implications. The truth is that Craft is a lot smarter and a lot more self-aware - we definitely get women framed as strippers, gothic lounge singers, hard-edged punks, thieves of virginity, or even outright succubi, but it never frames any of them being in the wrong, at least in comparison to their male counterparts. Take 'Berlin' or 'Black Mary' - one song focuses on a stripper, the other a cougar, but it's surprisingly sympathetic to both of them, in the former case showing her dominance of the situation and in the latter case more nuance, speaking to lonely melancholy that Craft wishes he could help relieve. Or take 'Lady Of The Ark', a song framing an ex-girlfriend as an angel who gets seduced and then dumped by another guy, framed as a fallen angel - but again, it's never cast in a vengeful light that she got her just desserts. It helps matters that Craft is far from a flattering character himself - his odd vocal tone doesn't exactly render him attractive, and when does play an active role, the writing doesn't shy away from showing how the relationships were probably doomed anyway, and he's mostly come to grips with that. 'Future Midcity Massacre' is a great example, where both he and his ex almost seem to be reveling in their newfound freedom, although it's implied they're both hiding more pain than they should. Or take 'Balmorhea', where his choice to abandon the titular singer after she showed real vulnerability - he only wanted her for a season - has left her stranded, her songs never being heard as time moves on. And this leads us to the themes and subtext of this record, because you could definitely make an argument that on much of this album Craft is revisiting the goth or alternative scene of his youth only to see it collapsing beneath his feet as people grow up. And there's pathos there in the feeling of being left behind or ignored, not just by partners - and tracks like 'Gloom Girl' indicate both sides do it and there really isn't much of an excuse - but by time itself. And while I really love 'Pentecost' for showing an alternative couple try to conform only to buckle under religious expectations and strictures as Craft offers them one more night to cut loose and 'unload the barrel', the title track right after shows things are changing regardless. And while Craft is definitely going to celebrate those who keep the faith like on 'Jane Beat The Reaper' - the metaphor is on the nose, but goddamn it works - the final track 'Three Candles' is the sobering realization that both sides do end up moving on. Craft realizes that he probably wasn't the best for his ex, and while he knows her new partner will never kiss her the same, her new relationship probably makes more sense and will last, and he's still kind of a mess right now, quite literally an old flame. In short... yeah, this record is absolutely awesome and deserves so much more attention than it'll probably get. Kyle Craft's fusion of five different brands of 70s rock might be directly aimed at my sweet spot, but it gets all the way thanks to great writing, excellent melodies, and one of the most promising frontmen I've heard in a while. And yeah, this'll probably be one of the best albums of the year, at least for me, so it's a 9/10 and the highest of my recommendations, especially if you're a Meat Loaf fan. Otherwise, this is one of the most catchy, genuinely fun goth-tinged rock records I've heard this year, and it's definitely worth all of your time - check this out!